Even though it is the month of love, life got the better of us and we dropped the ball on our #loveletteraweek challenge. (read all about the challenge here). To get ourselves going again, here's a recap of what we've sent so far, and what's going out this week! 1/52 Remember this: A love letter to ourselves that we saved and will read in 6 months. 2/52 hahahaha: A love letter that embraces the power of laughter. Re-living the giggles shared with a friend by writing them down and preserving them in this note. 3/52 dazzle: A love letter to the Women's March organizers for bringing millions of people together to honor our shared humanity, protect our rights, and prioritize love over hate. 4/52 Glad You're Here: Sent a little extra love and support out into the universe by thanking a friend who continues to be an inspiration. 5/52 choose love: A thank you note to our Civil Writes event partners JGSD and Brass Clothing. 6/52 love inside stamp: Debuting our stamp that we designed just for this challenge to decorate our envelopes and hint at the inside contents. This note was for our Valentine's Day birthday friends. 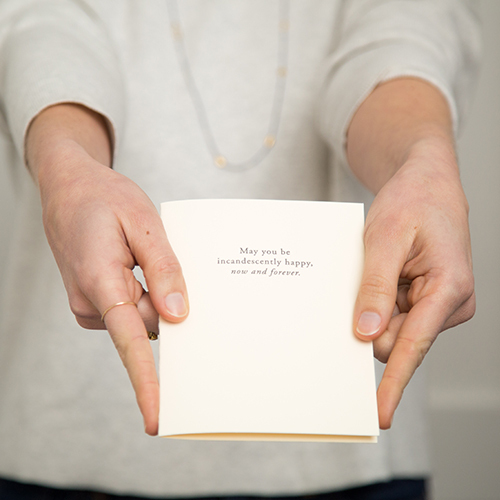 8/52 Incandescently Happy: A love letter for a couple on their wedding day. 9/52 Spring is for: It's hard not to be extra smiley with these unseasonably warm temperatures. Looking ahead to spring we are sending this love letter out to friends with whom we can't wait to get outside! Follow along #52loveletters and #loveletteraweek; it'll help us stay accountable!